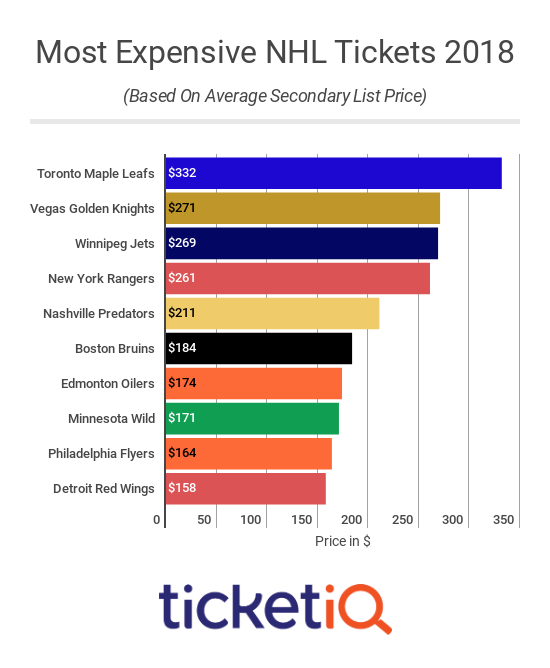 Toronto Maple Leafs tickets are always some of the hottest in the NHL and this year is no exception; after adding Tavares in the offseason, their tickets are the most expensive in the league, averaging $332 on the secondary market. Below them, the Vegas Golden Knights, coming off last years’ Cinderella run, have jumped to second overall in terms of average price. Two of the Western Conference’s best teams, the Winnipeg Jets and Nashville Predators, and the rebuilding New York Rangers round out the top five. 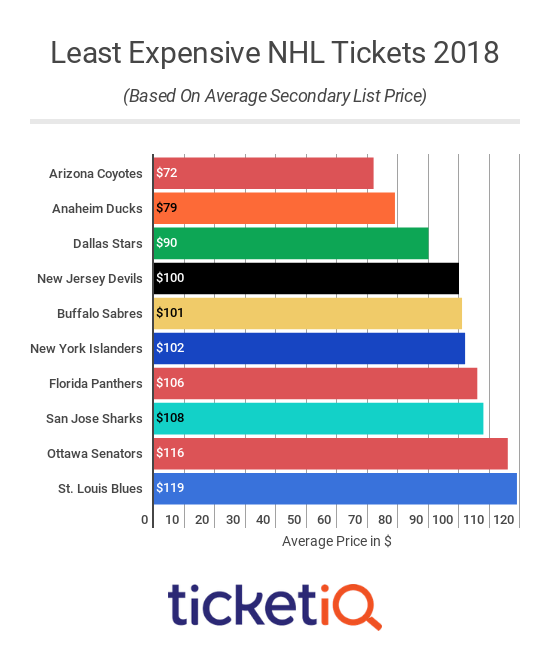 After finishing last season in the cellar of the Western Conference, the Arizona Coyotes enter 2018-19 with the NHL’s cheapest tickets; their average secondary market ticket price clocks in at $72, a drop of $21 dollars from last year. Beyond them, however, some exciting teams are towards the bottom of the price list. The Anaheim Ducks are a perennial playoff contender, the Dallas Stars boast an explosive offense, and the New Jersey Devils made a surprise postseason appearance last year. Even the Buffalo Sabres, who round out the bottom five teams, boast first overall pick Rasmus Dahlin. 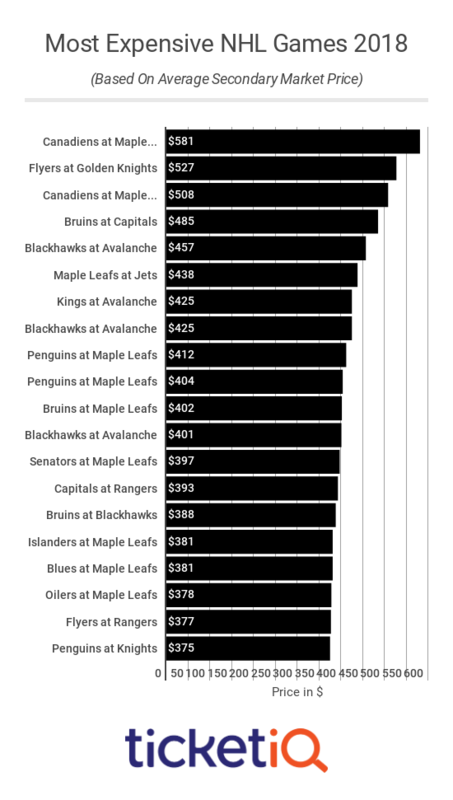 Unsurprisingly, Canadian teams—especially the Maple Leafs—dominate the most expensive games of the 2018-19 NHL season. 10 of the 20 most expensive games in the upcoming season take place north of the borders; the other top games mainly feature Original Six teams and, more surprisingly, the Colorado Avalanche. Based on Vegas Insider’s projected points and our average ticket prices, the best ticket value for 2018-19 is the Anaheim Ducks. Ryan Getzlaf and Corey Perry may be closer to the end of their careers than the beginning, but their team should be headed for their seventh straight postseason. On the opposite side of the spectrum, the Rangers are the most expensive, averaging $3.46 for every point this season. While the Blueshirt faithful won’t have many more years to appreciate Henrik Lundqvist, they’ll be paying a premium to see him back stopping a young team at Madison Square Garden. 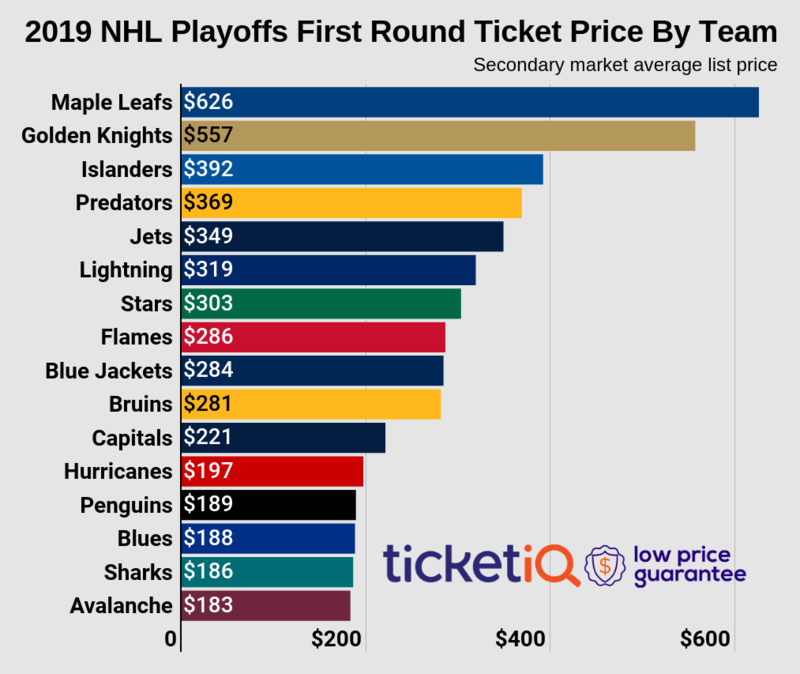 After making it to the Stanley Cup Final in their first year as a franchise, the Vegas Golden Knights understandably see one of the largest growths in average ticket price on the secondary market. That success, combined with the fact that they play in a tourist mecca, led to an increase of 38% per seat. Playoff success also helped the Colorado Avalanche and Winnipeg Jets market take a major leap; on the other hand, Chicago Blackhawks ticket prices dropped by a league-leading 38% as their dynasty comes to a close. Last year, 13 of the 31 NHL teams averaged 100% attendance or higher. 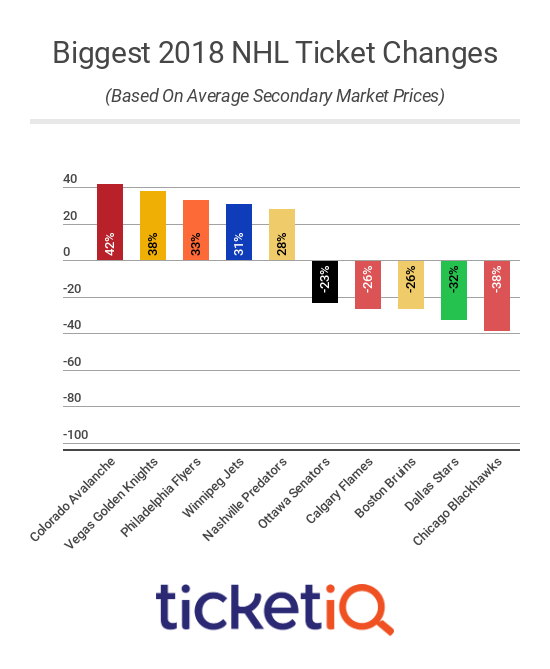 Even more impressively, six teams sold less than 90% of their tickets through the season. 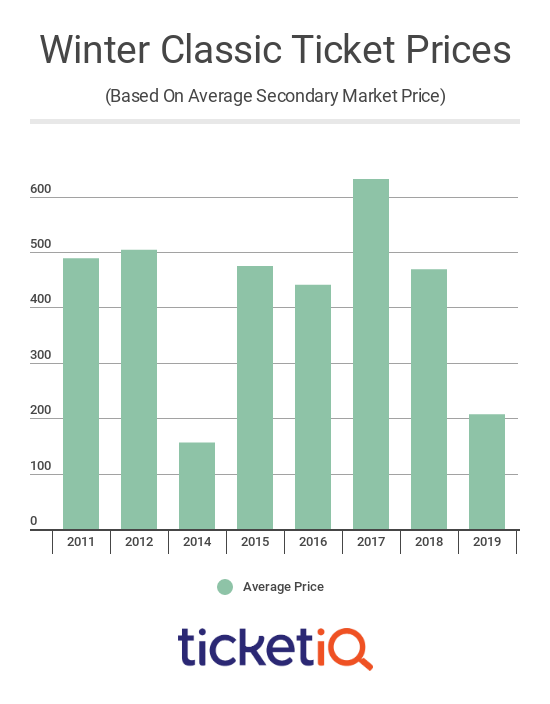 That reality means that the secondary market is the probably the easiest way to score some seats in 2018-19. Just be aware of your team’s ticketing policy; while some clubs have switched to mobile entry, others only accept printed tickets. Since 2008, the NHL has made a tradition of playing at least one outdoor game each year. This season, the Chicago Blackhawks and Boston Bruins will face off in the Winter Classic at Notre Dame Stadium while the Pittsburgh Penguins and Philadelphia Flyers renew their rivalry at Lincoln Financial Field. As any fan who has attended one of these games can tell you, it’s an amazing experience to sit in a massive crowd, watching your team play in the open air. If you’re willing to make plans a few months in advance, you can score a good deal for the 2019 Winter Classic. Tickets are currently the second cheapest of any Winter Classic to date; only the meeting between the Toronto Maple Leafs and Detroit Red Wings cost less. Tickets currently average $207 on the secondary market, with the cheapest available seat going for $100. It’s also worth noting that there is plenty of available on the primary market starting at $85; just remember that the game is taking place in a football stadium, so those affordable tickets will be farther from the ice than at your average hockey game. While the Winter Classic is a bargain, the same isn’t true for the stadium series. The average secondary market ticket to the rivalry game currently costs $252, while the cheapest available seat is $98. The tickets are still within the presale period, however, so it’ll be worth keeping tabs on both the primary and secondary markets as more tickets become available. This is not the first time the two Pennsylvania teams have met outside, though. 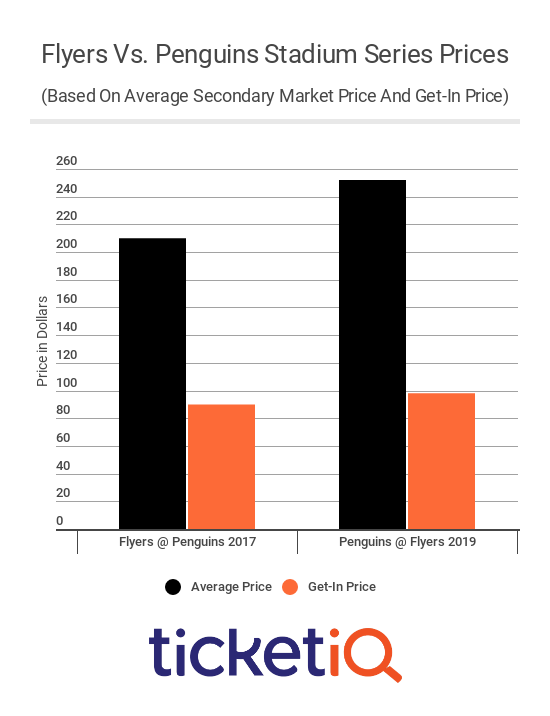 The average secondary market price and get-in price were $210 and $90 respectively when the two teams met outdoors in Pittsburgh two seasons ago. You should also remember that the Penguins and Flyers will meet four additional times this season; if you’re not interested in sitting outside, any of those games will be cheaper than the Stadium Series.